Occultation of Mu Ceti, Feb 3 2017 233203UT from Finbarr C on Vimeo. Occultation of 5 Tauri, 4th Feb 2017 175011 UT from Finbarr C on Vimeo. Occultations Theta 2 1 Tauri, Feb 5th 2017 from Finbarr C on Vimeo. Occultation of Gamma Tauri, 4th Mar 2017 203846 UT from Finbarr C on Vimeo. Mag 3.7; Lunar, 6 days 6 hrs; haze. 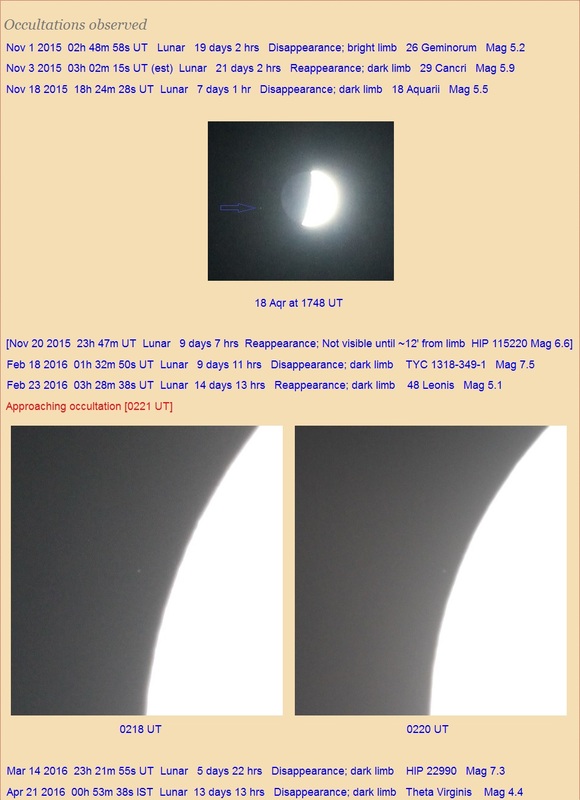 Occultation of 49 Leonis, 5 May 2017 001259 IST from Finbarr C on Vimeo. Occultation of Aldebaran – Dec 31 2017 010414 UT from Finbarr C on Vimeo.